All of his life Theodore Roosevelt was an admirer of Abraham Lincoln. His Secretary of State, John Hay, had been a secretary to Lincoln, and after his death purchased six hairs from Lincoln’s head taken during his autopsy. Almost 40 years after the assassination of Lincoln, Theodore Roosevelt was being inaugurated for his second term. 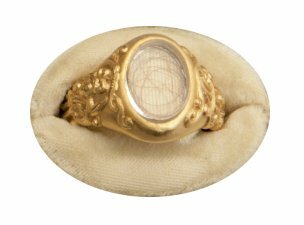 Hay sent him a special gift for him to wear while taking his oath of office, a ring, pictured above, containing one of Lincoln’s hairs. The hair in this ring is from the head of Abraham Lincoln. Dr. Taft cut it off the night of the assassination, and I got it from his son-a brief pedigress. Please wear it tomorrow; you are one of the men who most thoroughly understand and appreciate Linocln. I have had your mongram and Lincoln’s engraved on the ring. Longas, O utiman, bone dux, ferias, Praestes Hesperia. “Dear John, Surely no other President, on the eve of his inauguration, has ever received such a gift from such a friend. I am wearing the ring now; I shall think of it and you as I take the oath tomorrow. I wonder if you have any idea what your strength and wisdom and sympathy, what the guidance you have given me and the mere delight in your companionship, have meant to me these three and a half years? I’ve written you before about my experience as a docent at both the TR Inaugural Site where I grew up in Buffalo, and Sagamore Hill, on LI where I lived when first married (88-92). Anyway, I remember the ring well. For your readers, those were the days when after the house (Sagamore) closed in the evening, I was able to take off my shoes, put on white gloves, and walk about the North Room, pulling books from shelves and hefting TR’s devilfishing spears. Back then, before the politically correct crowd took over, and there were still guns in the “Gunroom,” I could also lift a shotgun from the cabinet and draw a bead on a squirrel on the lawn. In the basement, thousands of other marvelous articles were also kept, and I, who like TR, suffers from severe myopia, could peer though a pair of his spectacles (he was only slightly more nearsighted than I). I don’t know if you were aware. Long over-due and well-deserved if you ask me! Indeed Jon! I envy your opportunity to get up close and personal with TR’s possessions!